The AU480 is ideal as a primary chemistry analyzer for small- to medium-sized hospitals and laboratories, or as a dedicated specialty chemical or STAT analyzer for larger institutions. 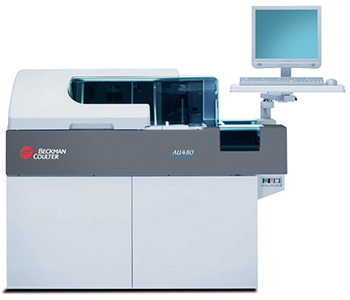 With random access throughput of up to 400 photometric tests per hour (up to 800 with electrolytes), 63 on-board parameters tests and user-definable sample handling options, the AU480 delivers efficiency for all your lab needs. AU480 CHEMISTRY ANALYZER WITH ISE INSTALLATION & TRAINING. Please give me a price on used unit and warranty if any. Can you tell me where this units drain location is? This seems to be a good equipment but is it possible to have the pricing for the refurbished and a new AU400 analyzer? What type of power outlet does the AU-480 require? We have it specified on the Equipment Schedule as 208V, single phase, 60Hz, 3500kVA, dedicated 20A circuit, but no outlet type.